Press a Play button to listen for free. You can also purchase a high-quality WAV download of the entire recording. Questions? Nowhere is Mintz’s zen-like reverence for the moment more apparent than on his extraordinary new 2-CD set, Ugly Beautiful. Recorded on a December day in 2015 in one room with no headphones (“when you record that way you can hear the instruments naturally”), it documents his quintet playing his eclectic reserve of original compositions. Being in the moment does not mean being unprepared. Indeed, from Mintz’s point of view, preparation is a prerequisite for spontaneity. At the age of 69, he still practices every day; not just out of a highly developed work ethic, but out of sheer joy and love for the process. The band members are also well-prepared to dig into the Mintz repertoire. (They clock a total of 75 years playing with Mintz.) Their intimate familiarity with Mintz’s music is a catalyst for a freedom and spontaneity that was more common in the bygone era of six-month six-night-a-week nightclub engagements. Take the two versions of “Flight”. These musicians have played this simple 32-bar gem on the order of, not years, but decades. Only a combination of preparation and abandonment to the moment could produce two such disparate takes: one a model of swinging tonal exposition and the other a pure distillation of the tune’s essence. Mintz’s last CD, the 2015 release The 2 Bass Band…Live, featured his compositions and arrangements for his venerable nine-piece group. 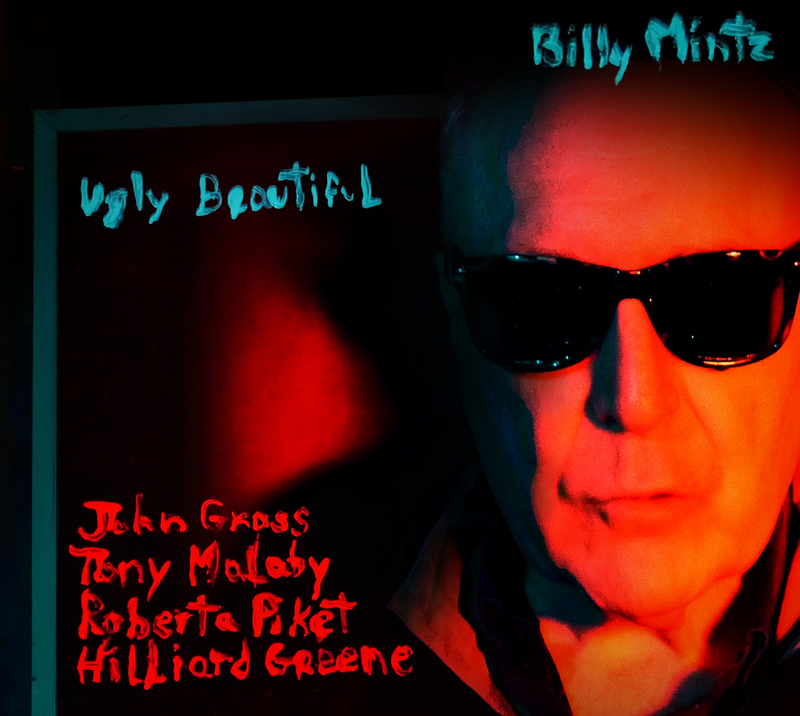 On Ugly Beautiful, he returns to the small group format, choosing for his front line west coast underground tenor legend John Gross and noted tenor and soprano master Tony Malaby. Respected bassist Hilliard Greene is a newcomer to Mintz’s music. Like the other band members, he is drawn to both straight-ahead jazz and free improvisation, having played with Little Jimmy Scott as well as Rashied Ali and Daniel Carter. Mintz met Greene on a Piket gig. “Even though we’d only played together once, about eight years ago, I thought of Hill for this music because of the big, deep, dark sound he gets on the bass,” he declares. In concert, Mintz likes to draw the listener in, rather than loudly announcing his presence from the first note. He has been known to play so quietly that the drums can barely be heard over the room noise, until the audience gradually realizes something extraordinary is happening, and the clamor evaporates. Similarly, on Ugly Beautiful, the program starts with two understated ballads: “Angels” and “Vietnam”. The latter is his first original composition, written at the age of 18. “Cannonball”, a 24-bar blues with Hammond B-3, is a reference to the great alto saxophonist, while “Shmear”, “Dit”, and “Relent” provide open forms for free improvisation. The program concludes with an “extended” version of “Cannonball”, restoring a reluctantly deleted Gross tenor solo as well as a handful of choruses edited out of Malaby and Piket’s solos. “I know this track is very long by the standard of recordings now, but John’s solo was just too good to discard, so I added this as a bonus track,” explains Mintz. A veteran of both the LA and New York jazz scenes, Billy Mintz is that rare breed of jazz musician who is as comfortable playing standards in a piano trio as he is performing in the “creative music” scene. During his formative years in New York City, Mintz played and recorded with the Lee Konitz Nonet, Kundalini with Perry Robinson and Badal Roy, the Eddie Daniels Quartet, Gloria Gaynor, and the Harold Danko Quartet. In 1981 Mr. Mintz relocated to Los Angeles where he was a member of the Mike Garson Trio with Stanley Clarke, ¬¬the Kim Richmond Sextet, the Bobby Shew Quintet, the Joey Sellers’ Jazz Aggregation, and the Vinny Golia Quartet. In 1988 he toured Europe with Charles Lloyd. Since 2003 Mr. Mintz has lived in New York where he has recorded and performed with the Alan Broadbent Trio, the Hal Galper Trio, the Russ Lossing Trio, the Mark Feldman-Sylvie Courvoisier Quartet, Ellery Eskelin, and others. He also has performed numerous solo drum set concerts worldwide. Billy has two CDs on Thirteenth Note Records: 2013’s Mintz Quartet, and 2015’s The 2 Bass Band…Live. Of his commercially dubious decision to release a two-CD set, Mintz says simply, “I had a lot of music I wanted to record. I don’t know when I might record again. “I don’t think too hard about the musicians I want to play with. If it’s right, you don’t need to over-think it.” For Mintz, there was no grand plan on that December day other than bringing together the talents of these four musicians to play his music. This recording captures that moment.